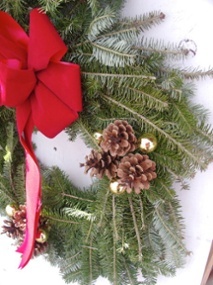 Decorating your home for the holiday season doesn't have to be ultimately expensive in order to do it eco-friendly. There are many ways you can keep a sense of style for the season by using the resources that are available to you in your area. 1. Recycled Stockings - One of the most prominent decorations of the holiday season is the mounting of stockings at the fireplace or other location in the living room. Using old sweaters and shirts, you can make unique stockings for the family in a variety of styles. One of my husband's favorite stockings is one made out of a 10-year old Hawaiian shirt. Once he realized he wasn't going to be small enough to wear it again, he was open to it's modification. As it turns out, it is one of his favorite holiday decorations and provides him with memories every year. 2. Pine Cones - Nature has a way of providing us with decorations without trying. 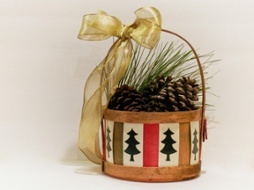 Pine cones in a bowl can be seen in a variety of homes as a symbol of the changing seasons. On a side note, pine cones can last for years without losing the luster that follows them, so you don't really need to throw them out. However, they are eco-friendly and can be used in mulch for your spring garden. Just don't forget to collect more in the fall for your decorative needs. 3. Blown Light Bulbs - Instead of throwing out old bulbs, why not paint them as decorations for the Christmas tree? 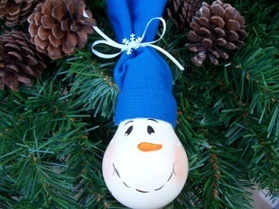 With a bit of acrylic paint, you and your family can create unique decorative bulbs that can last throughout the years. In many ways, these bulbs are superior to store bought items as the glass is a bit thicker and able to support itself against greater punishments - especially if it's coated in paint. 4. Candle Containers - What is the sense of throwing out a perfectly good glass container that once sat a hot apple cider fragrant candle? As you can buy seasonal candles that could use a container, these glass "cups" can be reused indefinitely. Not only do I still have the same jars for the past four years, but I even kept the plastic covers for them in order to reduce the dust collection on the candle itself. Dust sticks to wax quite easily. In fact, you can melt down remaining wax and use these cups to create layered candles of your own with wick you can buy at any hobby shop. 5. Brush Clippings - For those who have bushes lining their driveways and sidewalks, the clippings from these plants can be recycled to create decorations galore. Instead of throwing out these clippings, you can make everything from homemade wreaths to place settings on the kitchen table. In fact, you could surround a glass bowl with pine cones with tied bush clippings in order to present a marvelous appearance. There are many things you can use around the house to add an eco-friendly atmosphere to the holiday season. You're only limited by your own imagination as plant-woven bicycle spokes can create a wreath for the front door. What ideas have you developed for the holiday season that are eco-friendly? This is a guest post by Liz Nelson from WhiteFence.com. She is a freelance writer and blogger from Houston. Questions and comments can be sent to: liznelson17@gmail.com.